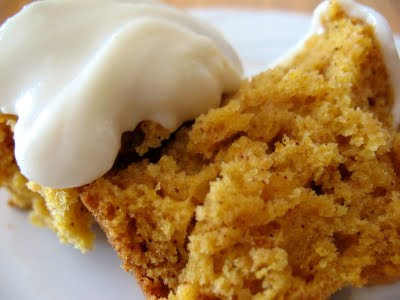 I'm usually skeptical about pumpkin in a muffin, because most recipes I try end up with a very heavy, wet, and sticky end product. This recipe is not like that at all! Moist but light, these are a cross between a cupcake and a muffin. 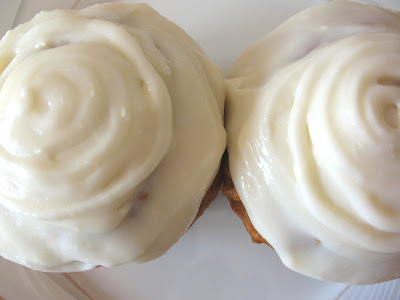 Do NOT skimp on the cream cheese icing, because these are just crying out to be ripped apart and greedily devoured, as you lick the decadent sweetness from your fingers. 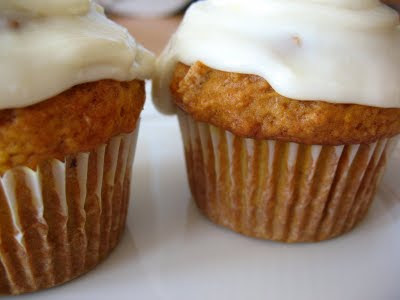 If you are worried about calories, use light cream cheese and note the muffins have little oil in them. In a large bowl, whisk together the flour, sugar, pie spice, baking powder, baking soda, and salt. In a separate bowl, beat the eggs; stir in pumpkin, buttermilk, and vegetable oil. Pour into flour mixture and stir until just moistened. Spoon into large paper lined cups, filling to the top. Bake at 375 F for about 25 min, or until cake tester inserted into the center comes out clean. Cool on rack. Icing: Beat cream cheese, butter, and vanilla until fluffy. Add icing sugar and beat until smooth; frost cooled cupcakes.